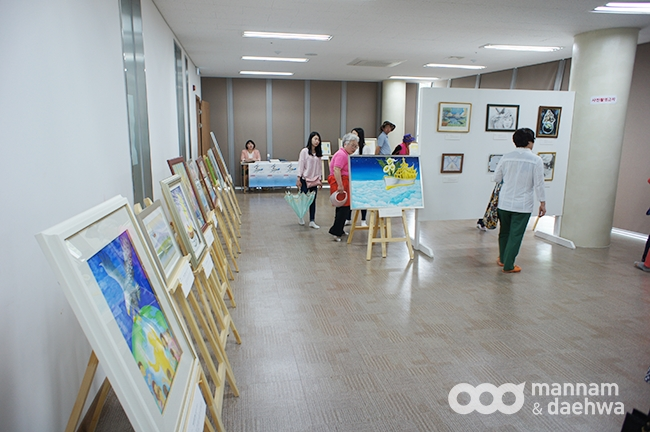 The closing of the 2015 Christian Gospel Mission Art Exhibition of put up the mast and sail has now ended. He suggested that we paint artworks according to the theme, “Put up the mast and sail” and have an exhibition for the artworks that are exemplary. He also told us that through the exhibition, we should evangelize lives. Pastor Jung Myeong Seok personally designed the exhibition from the start to the end. He gave awards to the artworks that were displayed at the exhibition. This was the first art exhibition held by the Christian Gospel Mission. It was truly a festive celebration of the sail of Providence. There was a total of 255 participants and 261 artworks submitted. Of the 255 candidates, 186 were from Korea and 69 from other countries (Japan, Taiwan, Hong Kong, Malaysia, Singapore, Phillippines, Viet Nam, Mongolia, United States, Canada, England and New Zealand). In total, 255 participants, a few were art graduates, while most were people who have not studied art. The ages of the participants ranged from junior high school students to people in their 60s. Many members from both Korea and foreign countries showed interest and participated in the event. 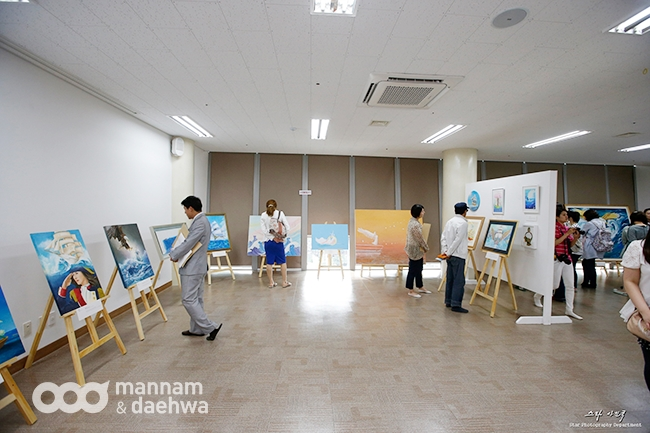 From the 261 artworks, 75 artworks (66 winners and 9 excellent works) were selected for display. There were numerous stories behind the artworks that were submitted. One of these stories was about a member who won a prize after their love for Heaven was revived through drawing an artwork for the exhibition. Through receiving the prize, the member received the opportunity to visit Wolmyeongdong. Another story is of a Japanese member who painted the artwork with their mother, in order to evangelize her. As they were painting, their father came to be interested and carved a seal for them. Both parents attended the opening and award ceremony with the member. When the parents visited Wolmyeongdong for the first time, they were very moved by the love of the Trinity, and they gave thanks and glory to the Trinity. The core message, which we should never forget throughout this year, is “put up the mast and sail.” We give eternal thanksgiving and glory to the Trinity who allowed us to open this exhibition so that we would never forget this vital message, but would engrave it deeply in our minds and thus, rapture.